The Chord Blu Mk2 is a recent addition to the Chord family, and a sister for DAVE – the ground-breaking DAC designed by Rob Watts. A conventional CD transport, together with the ability to upscale CD to 768kHz, makes this a natural upgrade for the DAVE, taking its ability to utilise its 164,000 taps in the Watts Time-Aligned Filter to over a million! 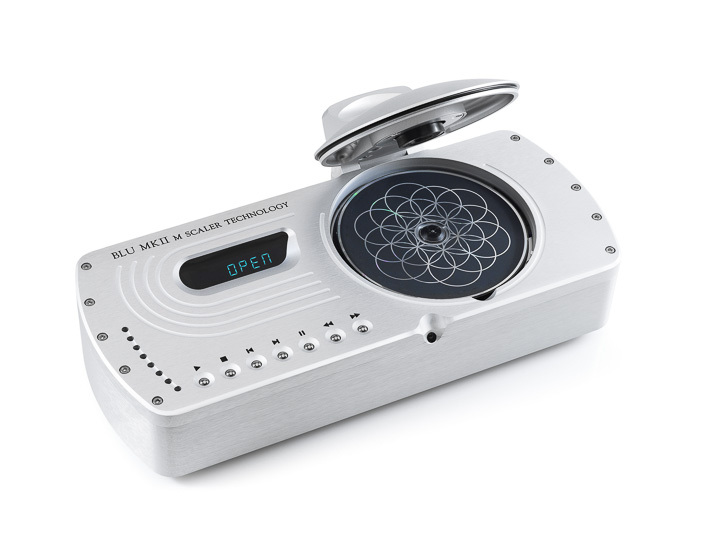 The Blu Mk2 comes in an aluminium case which is of similar dimensions to the DAVE. It has digital inputs for USB up to 768K, a BNC S/PDIF input, and outputs comprising a single AES/EBU, a Dual AES/EBU, and the similar configuration for S/PDIF outputs. Conventional CD buttons provide the usual functions, which can also be accessed by the supplied remote control. There are two small switches on the back; ‘Dither,’ which only works with a 16 bit output, and a toggle which gives three levels of upscaling. The CD is inserted by flipping a metallic cover back, and dropping the CD into the playing space. Getting it out is more of a procedure. There is a modest insert in the CD surround below to insert your finger in order to remove the CD. Not the easiest procedure for someone with fat fingers, and difficult to do without coming into contact with the playing surface of the disk. It’s not the most gloriously beautiful way to load and unload a CD, but I suspect that not having a drawer may save trips to the repair shop in twenty years time! The internal mechanism is the Philips CD Pro 2 Mech favoured by many manufacturers, and known for its reliability. Upsampling aside, it’s a CD transport, so its operation and installation are well known to all. The only real caveat to that is to get the full benefit of that upsamping between Blu Mk2 and DAVE, you need to connect using a dual BNC arrangement, and there’s an unofficial (though Rob Watts approved) idea of slipping ferrite beads over these cables at the Blu Mk 2 end for maximum performance.